Combo (USB / Firewire) External Enclosure. Leather case. 2x FireWire400. The OWC Envoy Pro USB3.0 Portable SSD enclosure is designed to fit the factory-fitted SSD from the MacBook Pro Retina Display model, turning this SSD into a useful portable storage solution. Suitable for both PC and Mac via USB3.0 port. Sleep elegant design complements the MacBook Pro design. Powered by USB port, no external power required. All SMART tests show good - only errors listed or from a bad cable in a previous machine (SATA CRC errors, not related to the drive!). Experience incredible portable performance in the palm of your hand. The OWC Envoy Pro combines elegance and functionality in sleek, portable external storage for Apple Flash SSDs (June 2013-Current Mac Models). OWC ThunderBay 4 Mini Thunderbolt Hard Drive Enclosure - OWCTB4MJB0GB. Power adapter included. Condition is Used. Shipped with USPS Priority Mail Medium Flat Rate Box. OWC Envoy Pro USB3.0 Enclosure. NO SSD is included. Enclosure Screwdriver. Perfect working condition - used for a couple of hours to migrate date during upgrade. Sold AS-IS. Does not include screws. We have been serving the Apple community since 1995. mac of all trades. 1 x Power Adapter and Cords. Very Minor Scuffs on Case. Condition is Used. it turn on but I'm not sure that is working. OWC / Other World Computing 6.0TB Mercury Elite Pro Dual Drive RAID. Condition is Used. THUNDERBOLT/USB3.0Drive has been tested and formattedUsed as an archive for production work, used sparingly. OWC MANUAL PDF is available (free) here Mac / PC / USB 2.0 & 1.1 / FireWire 800 / FireWire 400 / eSATA. eSATA cable. Multi-Interface 4 Bay Professional Grade Performance RAID Enclosure - 0GB. Firewire 400 cable. 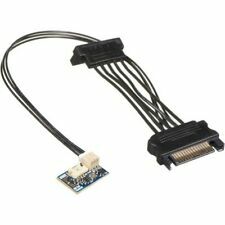 • Cables for all four interfaces: FW800, FW400, eSATA, and USB 2.0. • Cable for extra power using FW800. My apple computer finally died and my new work PC doesn’t have the interface for this enclosure. This is a working RAID, I just no longer need it. NO hard drive included. MANUFACTURER BOX CONDITION. FUNCTIONALITY: Power on Tested, no other functions have been tested. owc mercury elite - al pro . Condition is New. Shipped with USPS Priority Mail. OWC ThunderBay 4 4-Bay Professional-Grade Enclosure. Condition is Open Box - New. JBOD / RAID Support: JBOD: Utilize each of the four drives independentlyRAID: Use any Software RAID of your choice to setup the ThunderBay 4 for multi-drive performance or data redundancy. The Mercury Envoy is designed to fit the factory-fitted SSD in the Macbook Air 2010-2011 models, turning this SSD into a useful portable storage solution. Suitable for both PC and Mac, via either USB3.0 or USB2.0. Sleek elegant design complements the MacBook Air models. Powered by USB port, no external power required. OWC Mercury Elite-AL Pro Enclosure and Power Supply. Condition is Used. Shipped with UPS Ground. 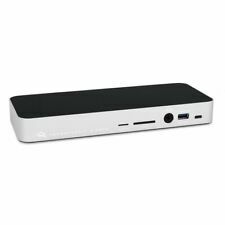 OWC / Other World Computing 11-Port USB Type-C Docking Station (Silver). Five USB 3.0 ports (including a USB Type-C). Mini DisplayPort interface. Combo audio in/out port. Front facing SD card reader. OWC Mercury Elite Pro Qx2 - FW800, eSATA, USB3.0. Condition is Used. Comes with one key, USB3.0 Cable, Power Cable, one NewerTechnology AdaptaDrive for using a 2.5" drive in the standard tray, and Original Packaging. I used this with my Mac Mini as a home media server for less than a year. Raid options 0, 1, 5, 10, span, and independent. I had no problems and it worked great for my needs. I've recently upgraded to a NAS device and moved the hard drives with it. NO HDDs included. Portable, Bus-Powered USB 3.0 Enclosure, For Apple Flash SSDs. Suitable for Mac Pro Dec 2013, MBA 13" Early 2015, 11" March 2015, 13" Early 2014, 11" Early 2014, 13" Mid 2013, 11" Mid 2013, MBP 15" Retina Mid 2015, 13" Retina Early 2015, 15" Retina 2014, 15" Retina 2013-2014, 13" Retina 2013-2014, iMac 27" Retina Late 2014, 27" Late 2013, 21.5" Late 2013, 21.5" Mid 2014, Mac mini Late 2014. Model : OWCSSD7E3G060. Features : 2.5" SSD | 60GB capacity | SATA. Notes : These are three used SSDs that have been tested and are healthy. Condition: Used. • Tested for Key Functions, R2/Ready for Resale. OWC Mercury On-The-Go Pro 1.0 TB USB 3.0 & 2.0 7200 RPM Portable Bus Powered Sol. Condition is New. Shipped with USPS Priority Mail (1 to 3 business days). OWC Envoy SSD Enclosure. 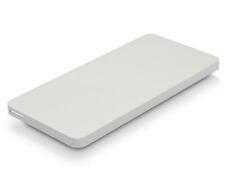 You're purchasing an OWC Envoy SSD USB 3.0 enclosure for 2012 MacBook Air SSDs. The unit is unused. Includes USB cable and soft case. For 2012 MacBook Air SSD. It's normally faster, but lets play it on the safe side! There is a slight chance that they are 5400 RPM. Each drive has two Firewire 800 ports so that they can be daisy chained. There is also one Firewire 400 port. Note that these drives DO NOT have USB ports. 3 Year OWC Limited Warranty. 4.0TB Dual bay Thunderbolt 2 and USB 3.1 Gen 1 equipped performance RAID solution. Our goal is to resolve any issues with your order. Grade A: May show very minor signs of wear. Reported issue(s). We have been serving the Apple community since 1995. 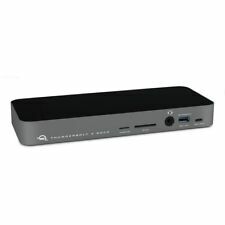 OWC Mercury Elite Pro 3.5" 2 Bay Hard Drive Enclosure USB3.0,Firewire 800 Mac/PC. Condition is New in sealed box. Wewill be happy to help you with a service advice. Compact and Versatile - If you're looking for one of the most compatible mass storage solutions made, look no further! The built-in aluminum heatsink underneath the drive and passthrough cooling vents on the top of the case work in tandem to provide optimum results. ~ OWC Mercury Elite - AL Pro /// Works Great ~ .. RAID 0, 1, 4, 5, 1 0 (10) support via SoftRAID engine. OWC Thunderbay 6. This Thunderbay 6 includes the 6 hard drives, with a total of 24 TB available.The hard drives were opened but never used. They're installed in the unit. OWC SuperSlim Mfr P/N: VLSS9TOPTU2 OWC SKU: OWCVLSS9TOPTU2 USB 2.0 optical drive. OWC SuperSlim external optical drive enclosure. OWC SuperSlim Assembly Manual & User Guide. OWC SuperSlim. The OWC SuperSlim for Apple SuperDrive solution makes CD and DVD burning and playing Plug-and-play easy with Macs and PCs. OWC Mount Pro 2.5" Drive Sled for Apple Mac Pro 2009-2012. Condition is Used. Shipped with USPS First Class Package. With industry standard 3.5" drive screw mounting locations, the AdaptaDrive enables you to install ANY size 2.5" SATA hard drive or SSD in a 3.5" SATA drive bay. Mfr Part #: NWTADPTADRV. Install ANY size 2.5" SATA hard drive or SSD in a 3.5" SATA drive bay. This drive is pulled from a new system and is tested and cleared. No one is EVER ignored! ALL PRODUCTS ARE MARKED WITH SERIAL NUMBER AND QC BADGE. Get Images that. OWC Express 4M2 With 4X Samsung Evo Pro 512gb SSDs PLEASE READ. Condition is Used. Shipped with USPS First Class Package. If you are looking at this you probably know what it is but please do your research before bidding. I believe you need to purchase Softraid for this to work. Everything is basically brand new. I thought I would have a place for this in my workflow but never did. SSDs never even had anything written to them other than a few speed tests.